In Windows 10, Microsoft has removed the classic Windows Update section from Control Panel, making it a lot more difficult for users to control Windows Update. The Windows Update section in Settings app offers little to no control over how updates are download and installed, particularly in Home edition of Windows 10. While this will indirectly force Windows 10 users to automatically upgrade to the latest Windows 10 build and keep their system up-to-date, most users prefer to have control on Windows Update. There are have been ways out there to completely disable Windows Update and pause Windows Update download but there is no concrete solution out there for Windows 10 Home users. Windows Update MiniTool is an alternative to Windows Update in Windows 10 Home and Pro editions. 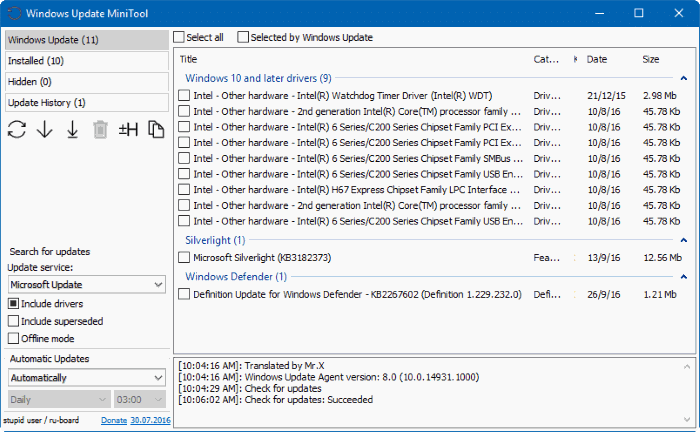 The Windows Update MiniTool helps you check for updates and install updates only that you want. Additionally, you can view all installed updates, hidden updates and there is an option to view full update history as well. As you can see in pictures, you can control how updates are downloaded and installed. You can choose either automatic, disable updates, notification mode (alerts when updates are available), download only (downloads but doesn’t install), scheduled and managed by administrator option to control how updates are downloaded and installed on your PC. Besides that, like Windows Update in Settings app, it also allows you stop automatic update of device drivers in Windows 10. There is an offline mode, which you can use to install updates on a PC not connected to the internet. Do you want to download Windows Update to install on another PC? 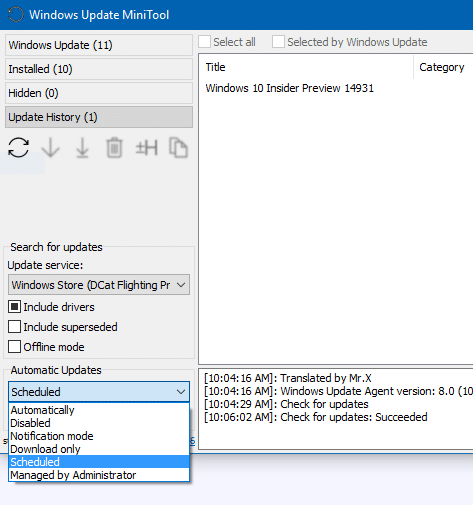 You can do so using Windows Update MiniTool as it gives direct links to .cab, .exe and .psf update files. Select an update, click Copy link to clipboard button and then paste the URL in the address bar of a web browser to download the update. For those who might be wondering, Windows Update MiniTool downloads updates right from Microsoft servers and saves them in C:\Windows\SoftwareDistribution\ Download directory. Overall, Windows Update MiniTool provides all Windows Update controls in an easy-to-understand interface. The program is standalone, meaning no installation is required. Finally, if you like Windows Update MiniTool, there is another utility called Windows Update Integrator which makes it possible to catch Windows Update notification popup, meaning when you click on Windows Update desktop notification it opens up Windows Update MiniTool instead of Windows Update section of Settings app. A word of caution. 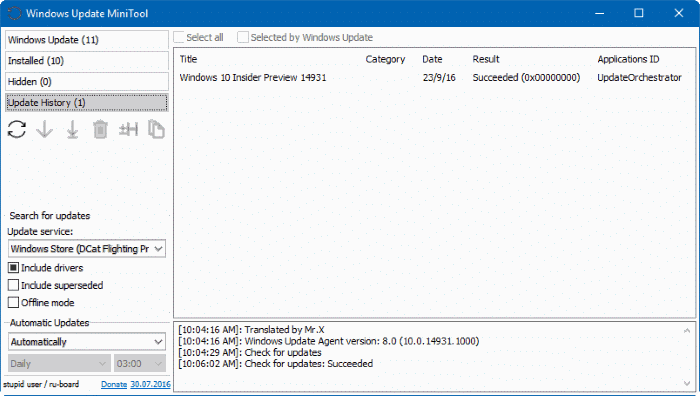 Windows Update MiniTool requires Windows Update service to download updates from Microsoft. So if you have disabled Windows Update, please enable it. OK … so do I just run it as a stand alone program or do I set it to run at startup or what? Does it automatically replace Windows Update when run? If it doesn’t then it’s just redundant. Sure, it has a little more control, but control of what? If it replaces Windows Update fine, but there’s nothing to say how to make it the sole updating agent. If it doesn’t, well … that’s just a mess now isn’t it? Just telling how to run the tool is not sufficient, you must also explain how it affects the built-in Windows Update. Is a very nice mini tool, thanks for sharing!